We conduct both on-line and direct trainings. We use the "click-meeting" platform for online courses. The courses are designed for those who start their high altitude mountain adventures as well as experienced mountaineers and organizers of high alititude trekkings or expeditions. Courses are led by Robert Szymczak – medical doctor, specialized in emergency medicine , himalaist who was on the summit of three eight thousand meter peaks (Everest, Nanga Parbat, Dhaulagiri). 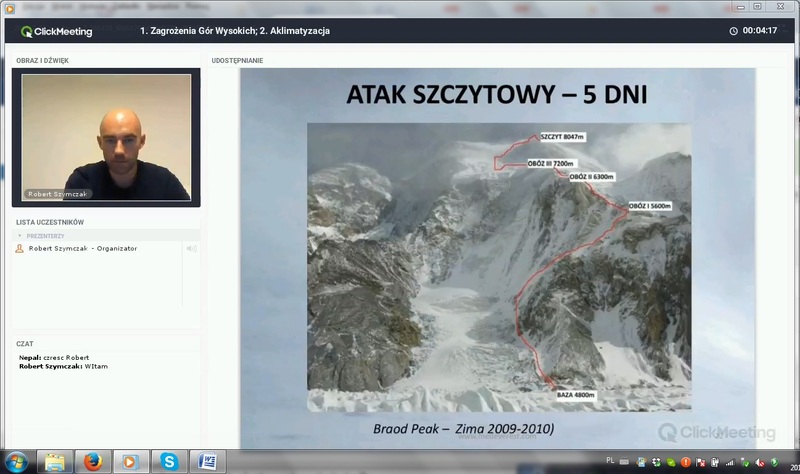 He was a climbing-doctor during Polish national winter expeditions to Nanga Parbat and Broad Peak. Robert is a lecturer of emergency medicine (Department of Emergency Medicine - Medical University of Gdansk, Poland) as well as mountain and expedition medicine (Medical Center for Postgraduate Education - Jagiellonian University in Cracow, Poland). He works in Helicopter Emergency Medical Service in Gdansk, Poland. 1. Dangers of the high mountains - "The Dirty Dozen"
10. Transport of the injured person - different methods. Preparation of improvised stretcher. If you want to take part in our pre-expedition medical courses please contact with us. We will choose the most suitable and financially optimal form of medical preparation and medical coverage for your expedition. If you want to participate in the course then send a confirmation of payment. Transfer title "payment for pre-expedition medical course"